Workers at Clyde Cooperage donated some of their wages to us and 4 other charities. Bosom Buds of Scotland was nominated by Keith McDowall, who is the stepfather of Lyn McAulley, a patient who has benefited from some of the support we offer. 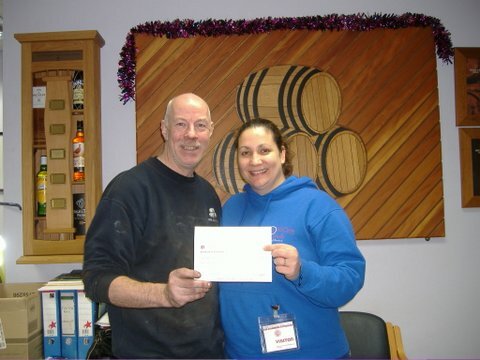 The men at Clyde cooperage donated £400 to Bosom Buds of Scotland, which was double matched by both their bosses at Edrington and The Robertson Trust, making a grand total of £1,200. A huge thank you goes out to the workers who kindly donated their wages, the bosses and Trust who matched them, with special thanks to Keith McDowall for nominating us.